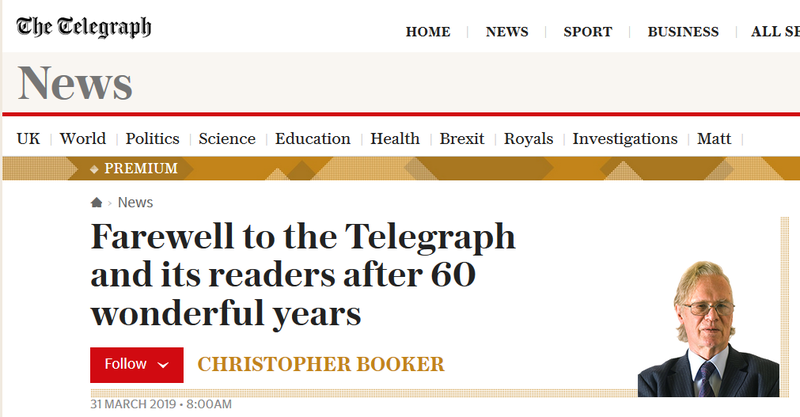 Sadly Christopher Booker has had to give up his column for the Sunday Telegraph because of ill health. I have been aware of his health problems for some months now. Nevertheless it is still a shock to read his final column. It tells us about his links to the Telegraph which go back 60 years to his first job with them, writing reviews of jazz records, then joining the newly launched Sunday Telegraph as a jazz critic in 1961. Since then he has gained fame as the first editor of Private Eye, scriptwriter for That Was The Week That Was, before rejoining the Telegraph with a monthly Saturday column in 1972. From the EU to global warming, and bureaucracy to the BBC, we will all miss his insights and willingness to challenge conventional wisdom.